Apparently my MIL's grand scheme worked! Whatever I read and gleaned from the book I have implemented in similar ways, producing a parenting style that is much like my MIL's. I'd have had no way to know that this was the case if Grandmother had not said so, because Bookworm1 was so young when MIL died. But now that he's 3 it's more clear what my parenting style is. And I'm glad to know it's like my MIL's. I can only look at my husband to know that the things she did worked in his favor. Now, the book How to Raise a Brighter Child does specifically deal with how you can prepare children in the pre-schooling days to be quick and curious learners. I don't know how well I follow the book's message. I really pay most of my attention to whatever it is that Bookworm seems to want to learn about and we talk about it as things come up. This book, How to Be a Genius makes me smile when I think about my kids. Of course, we all want our kids to be geniuses, right? For me, I know that my brain functions in a way that is complete different than Jonathan's and I think we're both fairly smart. To me, being a genius doesn't mean being able to do math very well or to win chess awards or go to law school or read lots of books or any one particular thing. Rather, I think the title of genius is most deserved by the person who figures out how their brain works - how they best function and how to best utilize the gifts that God gave them to use - and to use all of that well. Enter: How to Be a Genius . (Published by DK Publishers.) This is kind of a fun book to hand over to kids who enjoy straining their brain a bit. (This book comes in post-Brighter Child....)For starters, it teaches the different between the left side and right sides of the brain. (Jonathan is a left brain and I am a right brain. So, you see, you need both of us to make up anything of a complete personage!) The book talks about how most people have a dominate hand which they use, or even a dominate eye. It discusses the relationship between the brain and eyes and how things are taken in and processed (reminding me of Piaget's theory of cognitive development). "Tricky Pictures" and "Simple Illusions" are laid out so that the readers of this book can see how they might trick their eyes and brains. All of the senses are, in fact, covered in this book to discuss how we learn from touching things, hearing, sensing and smelling the world around us. One section of this book discusses "Your Brain and YOU" to give a reader a sense of their self and how they are uniquely who they are. A personality test (consisting of 30 questions) is provided should the young reader (or for that matter, the middle-to-older reader!) desire to learn more about who they are and how they think! 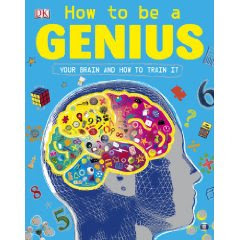 How to Be a Genius certainly is an entertaining and intriguing book for any age. But bottom line is: the smartest person is the one who learns what their giftings and talents are and pursues them with kindness, grace and love. Because if you don't know what your giftings are, you probably aren't being your most effective self. If you don't know how to use those giftings in a loving way, then you might as well not have the giftings in the first place for all the good they might do you! But the person who walks with an understanding that they were created with a unique purpose and they learn how to use their gifts well in real love is destined to be one of the most successful genius types that I would so love to see and meet. I DO want for all of my children to be geniuses in all the glorious individual ways that they were created to be so. I HOPE that they are not alike. I HOPE that they embrace the difference as perfect creative uniqueness. And if this book gets them thinking about how they are specially designed to be different, then I'm all for it! I wish I had read this book when I was a child. Maybe my grandson will. I have to admit that I only skimmed through your review, because I actually got this one in the mail this week! I requested a couple others from DK, but for each one that I've requested, they've also included one that I didn't. :) I haven't peeked at this one yet, but I believe my son has-- he loves every single thing to come out of DK! This sounds like an interesting book. Thanks for the mention of it.